We are happy to size virtually all of our rings, with the exception of titanium rings. Ring sizing is easy; simply add your size request in the Comments Box during checkout and we will notify you within 24-hours of the small additional cost for the ring sizing process. You may then decide whether or not you wish to have this additional work added to your order. Please note that once an item has been sized it becomes non-returnable. Sizing adds 4-6 business days to the shipping time. First you’ll need to measure your finger, which is quick and easy to do. Wrap a piece of thread or paper around the base of your finger where the ring is to be worn. Mark the thread or paper where it overlaps to form a complete circle, then simply measure the length of the thread or paper between the markings. 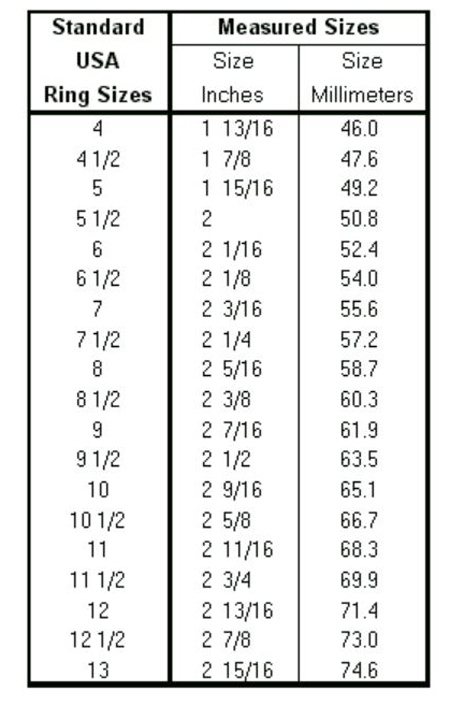 Now you have your size you can compare this measurement with the chart HERE to determine your correct ring size. 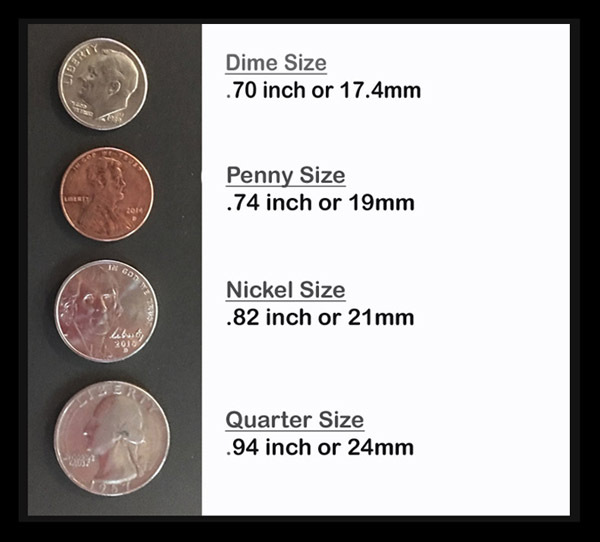 All jewelry is measured in millimeters (mm). Use our simple conversion chart HERE to accurately measure hoop earrings, earrings, crosses, lockets, or just about every item found on our site. If you require a special ring size, custom engraving or other options not highlighted in the product description, you may wish to place a special order. To do this, just add your requirements in the Comments Box during the checkout process. Be sure to include a valid phone number in case we need to contact you directly regarding your special order. Did you forget an important date? Don’t worry we’re here to help you! Just get in touch with us and we’ll do everything we can to expedite your order and get it to you in time. Much of our collection can be shipped overnight to ensure those ‘just in time’ gift deliveries get there when they should. If you have any other special delivery needs such as enclosing a special little personalized note, don’t hesitate to call us, email us or add the information in the Comments Box during checkout. We will do our very best to make your wishes happen. We strive to ensure the provenance of our diamonds, precious stones, precious metals and finished products to reflect the environmental and ethical standards we hold important. We uphold the Kimberley Process that tracks and certifies diamonds on an international basis, and we support Responsible Mining Practices to obtain precious metals. At Gracious Rose we believe your jewelry should be both good for you and good for the world. Why not turn your old, unused gold jewelry into something new and exciting! Broken chains, old earrings that went out of fashion years ago, an old ring or gift from an ‘ex’ you’d rather forget – you don’t want these, but you do want beautiful new jewelry to add to your collection, and we can make that happen for you. The value of gold is at an all-time high and by getting rid of your old, unwanted gold you’ll be able to get stunning new jewelry you’ll absolutely love to wear. Simply send us your old gold, we’ll refine it and pay you with store credit you can them use to purchase whatever your heart desires. Gold should be 14kt or 18kt and please ensure any stones you wish to keep are removed from your gold prior to sending it in, as we don’t remove or return stones. Once we’ve received your package of scrap we will qualify the metal and verify the weight. Next the metal will be melted and undergo a fire assay analysis, at which point we will notify you of the results and the price of your gold will be settled after-melt weight at the second London fix for the day of settlement. This sum will then be sent to you as store credit toward your new purchases. It’s simple really, send us your old gold, we clean it up and have it melted down, then give you the refined value as credit against new jewelry. We are not responsible for non-metal items sent with metal. Metal prices are based on market refinery values. DO NOT send teeth or dental pieces as they will be returned.